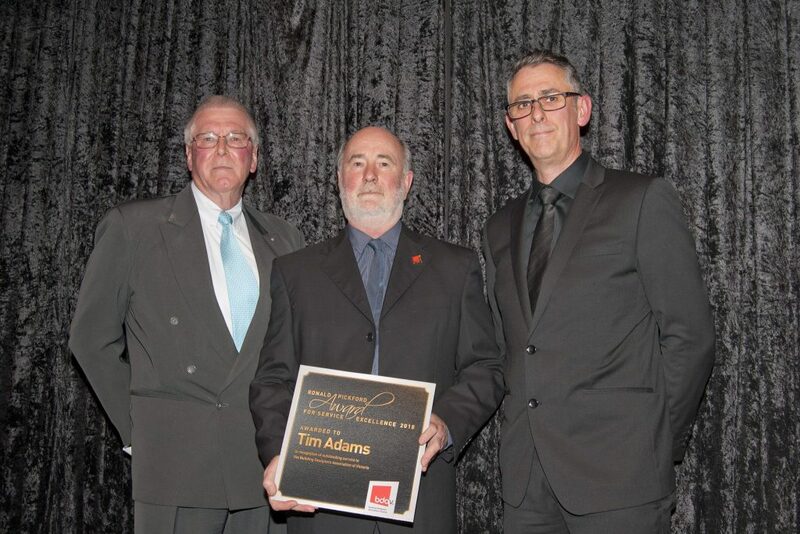 Tim Adams, FBDAV, is the recipient of the Ronald Pickford Award for Service Excellence 2018. The award was presented by Ron Pickford at the BDAV’s 2018 Annual Dinner. Tim has been a BDAV Member since 1999, and it is fair to say he has been a very active Member. He served as BDAV President from 2010 to 2012. In 2014, he was elevated to Fellow in recognition of this contribution to the Association over the years. Tim served on the BDAV’s Committee of Management from 2003 to 2014. He has been the Chair of the BDAV’s Energy & Sustainability Hub Advisory Board since 2010. He also chairs the BDAV’s Thermal Performance Assessor Technical Advisory Committee, another role he has held since 2010. Tim has provided editorial contributions to the BDAV’s monthly journal since 2009, and serves on the Editorial Committee. He also provides content and feedback for BDAV submissions whenever called upon. Tim was the founder and initiator of the BDAV’s 10 Star Sustainable Design Challenge in 2011, a program that has successfully profiled the sustainable design skills of BDAV Members. He was also responsible for BDAV becoming a NatHERS Assessor Accrediting Organisation in 2011, a role the BDAV continues to have. He also facilitates the BDAV Energy Rater Help Desk, which receives queries from Members on almost a daily basis. Tim prepares and deliveries BDAV CPD sessions in both metropolitan and regional areas when called upon. He regularly attends numerous meetings each year in the sustainability space on behalf of BDAV. He also participates in the Geelong Sustainability Group, given his commitment and passion for all things sustainable. All in all – a worthy recipient of this Award.